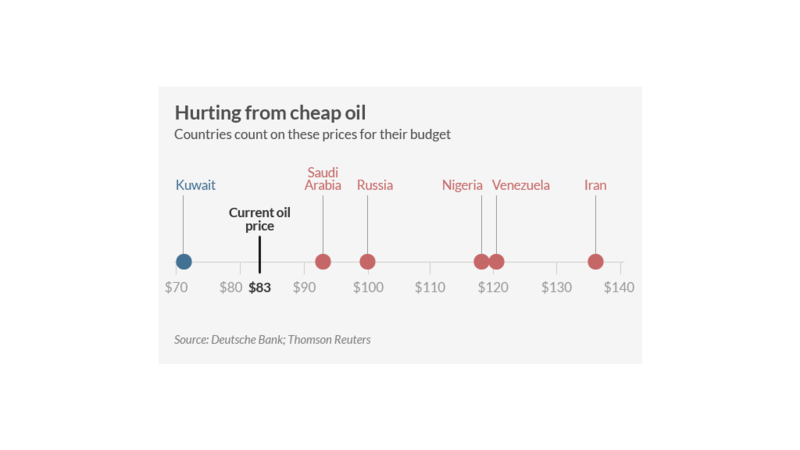 The price is not right for many oil rich nations. Oil is selling for roughly $83 a barrel on the global market. That's bad news for Iran, Nigeria, Venezuela, Russia, and Saudi Arabia, among others. They need the black stuff to trade at far loftier levels in order to balance their budgets. Iran's budget, for example, is built on oil at $135 dollars per barrel, according to data from Deutsche Bank and Thomson Reuters compiled by DoubleLine Capital. Russia has oil budgeted at $100, while Saudi Arabia will break even at $95 per barrel. "All the oil producers are feeling it. Now the question is who can withstand it the most," said Phil Flynn, an energy analyst at the Price Futures Group. Drill or die: Flynn claims that energy producing nations will continue to pump up production because they don't want to risk losing market share. "It's like a staring contest of who can last the longest selling oil below their budget point. Whoever can hold out longest is going to win," he said. "They're eating at each other." In the past, the OPEC would have likely stepped in by this point to urge its members to cut production, but the oil cartel has been dogged by internal diplomatic disputes and shifting political allegiances. Geopolitical fallout: The persistently low oil prices could change the geopolitical calculations for some nations that are already dealing with sanctions over their confrontations with the West. Branko Terzic, an energy consultant who used to serve as the commissioner of the Federal Energy Regulatory Commission (FERC), thinks the depressed prices might bring Russia to the negotiating table over its actions in Ukraine. He's less optimistic about Iran, even though the country's economy has been crippled by sanctions over its nuclear program. "In the past they've put ideology over economics, and it's not clear if that will change," he said. There's speculation that Saudi Arabia is refusing to cut supply in order to squeeze Iran. The two countries from opposing Islamic denominations are vying aggressively for dominance in the Middle East. Related: Saudi Arabia: The next big emerging market? Budget squeeze: Low oil prices may force some governments to make tough cuts. 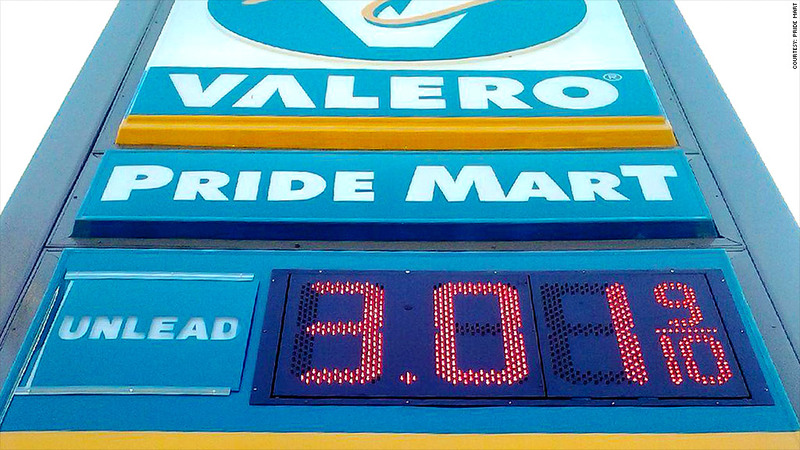 Venezuela heavily subsidizes the cost of gasoline. A gallon usually costs drivers around seven cents, Terzic noted. Already facing declining oil production, skyrocketing inflation, and dwindling foreign exchange reserves, the nation's socialist government may be forced to look at its budget to see what it can cut without roiling the public. In Russia, finance minister Anton Siluanov is already talking about the need to cut spending by 10%. "The budget can not constantly have expenses that were made at different economic reality," he recently told the Russian parliament. Buying time: But Russia, like some other nations, is still sitting on a healthy chunk of foreign exchange reserves, which it can dip into to help buy time as oil remains low. At oil's current level, Russia can cover its budget for four years, Terzic estimated. Saudi Arabia has about eight years. Nigeria, on the other hand, isn't as fortunate. The country can only sustain the current situation for a few months. American energy game changer: The biggest shift in global energy markets is that the U.S. is producing an unprecedented amount of oil now. Even though America has a ban on exporting crude, the fact that it's importing less has led to a flood of foreign oil on the global market, according to Terzic. Related: Is the U.S. holding too much oil in reserve? "It reduces our reliance on the production in unstable areas. It's minimizing the impact that these Middle Eastern countries are having on global affairs," he said. "This is good news for all of us."